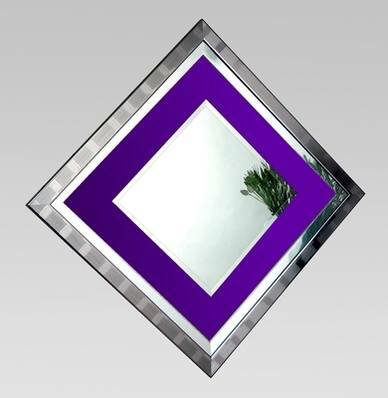 Xena mirror a pewter and polished chrome effect frame, with a bevelled mirror mounted on a purple glass back. Overall size.112x112cm when hung diagonally. This is a new colour addition to our range for todays contemporary look. Xena mirror pewter & polished chrome effect frame with a bevelled mirror mounted on a purple glass backing. Also available with black, red and clear glass backing.